Hugo Colace's goal for Barnsley condemned Middlesbrough to a sixth loss in 10 games under Gordon Strachan. The visitors took the lead when Justin Hoyte linked up well with Adam Johnson down the left before his attempted cross luckily flew in from 35 yards. Barnsley drew level after the break as Emil Hallfredsson's corner fell to Daniel Bogdanovic who flicked the ball over for Stephen Foster to nod in. On the hour Bogdanovic crossed from the left for Colace to head in the winner. It is a worrying run of form for Strachan's men who now sit in 11th spot in the Championship table, while Barnsley can boast an unbeaten run of eight games. Middlesbrough, though, begun brightly and before their lucky opening goal, midfielder Julio Arca had already forced Barnsley goalkeeper Luke Steele into an impressive save. Barnsley fought back and Iceland international Hallfredsson fired a 30-yard piledriver just wide, while Colace saw a long-range effort blocked defender David Wheater. After Foster's equaliser, Boro hit back strongly with Gary O'Neil's lob going close from the right but it was the hosts who grabbed all the spoils with Colace's powerful header. "In the first half we couldn't get near them, it was difficult to contain them, we had to get them - that's why we pushed Bogdanovic up front. "It was a better second half - we were determined to carry on our run and that's why we didn't let our heads drop. It's a great end to the year. "That was only our fourth home win of the season, when I came here we only had one point and it shows how well the players have done since I came here." "We were disappointed to lose the game but we couldn't match them. "We won the football match in the first half and they decided to turn it into a cup tie and then they won it. "There was nothing wrong with the first goal and the second one was made by a good cross." 90:00+4:19 The referee brings the game to a close. 90:00+3:51 Close range strike by Luke Williams goes over the bar. 90:00+2:41 Andy Gray gives away a free kick for an unfair challenge on Rhys Williams. Free kick crossed right-footed by Gary O'Neil from right wing, clearance made by Jacob Butterfield. 90:00+1:37 Luke Williams has an effort at goal from outside the box which goes wide right of the target. 90:00+0:13 Free kick awarded for an unfair challenge on Daniel Bogdanovic by Chris Riggott. Direct strike on goal from the free kick comes in from Emil Hallfredsson, Chris Riggott gets a block in. 89:17 Corner taken short by Emil Hallfredsson. 86:42 Foul by Chris Riggott on Andy Gray, free kick awarded. Direct effort from the free kick comes in from Jacob Butterfield. 86:15 Emil Hallfredsson produces a left-footed shot from just outside the penalty box that misses to the left of the target. 85:43 Emil Hallfredsson takes a inswinging corner to the near post, clearance made by Tony McMahon. 83:28 The assistant referee flags for offside against Adam Johnson. Luke Steele takes the free kick. 82:56 Daniel Bogdanovic is caught offside. Rhys Williams takes the indirect free kick. 82:02 Emil Hallfredsson takes a shot. David Wheater gets a block in. 80:43 Tony McMahon takes the direct free kick. 80:43 Booking Emil Hallfredsson shown a yellow card. 80:26 Foul by Emil Hallfredsson on Tony McMahon, free kick awarded. 78:50 Bobby Hassell produces a right-footed shot from the edge of the area and misses to the left of the goal. 76:48 Adam Johnson has an effort at goal from just outside the box which goes wide of the right-hand post. 76:01 The free kick is delivered right-footed by Tony McMahon from right channel, clearance by Hugo Colace. 76:01 Booking The referee books Jacob Butterfield for unsporting behaviour. 75:55 Jacob Butterfield concedes a free kick for a foul on Marcus Bent. 75:03 Emil Hallfredsson gives away a free kick for an unfair challenge on Gary O'Neil. Free kick taken by Danny Coyne. 74:23 The assistant referee signals for offside against Marcus Bent. Free kick taken by Luke Steele. 72:58 Substitution Luke Williams comes on in place of Jonathan Franks. 72:32 Gary O'Neil takes a shot. Luke Steele makes a save. 72:11 Gary O'Neil takes the outswinging corner, clearance by Anderson De Silva. 71:15 Bobby Hassell sends in a cross. 69:36 Inswinging corner taken by Jacob Butterfield, clearance made by David Wheater. 67:32 Adam Johnson gives away a free kick for an unfair challenge on Robert Kozluk. Luke Steele restarts play with the free kick. 65:04 Julio Arca concedes a free kick for a foul on Jacob Butterfield. Free kick crossed by Emil Hallfredsson, Tony McMahon makes a clearance. Corner taken by Emil Hallfredsson played to the near post. Daniel Bogdanovic handles the ball and concedes a free kick. Free kick taken by Danny Coyne. 63:35 Foul by Julio Arca on Daniel Bogdanovic, free kick awarded. Bobby Hassell restarts play with the free kick. 62:05 Effort on goal by Rhys Williams from 25 yards. Blocked by Hugo Colace. Inswinging corner taken right-footed by Gary O'Neil, save by Luke Steele. 61:29 Unfair challenge on Chris Riggott by Jacob Butterfield results in a free kick. Danny Coyne restarts play with the free kick. 60:29 Marcus Bent is caught offside. Luke Steele restarts play with the free kick. 58:04 Assist by Daniel Bogdanovic. 58:04 GOAL - Hugo Colace:Barnsley 2 - 1 Middlesbrough Hugo Colace scores a headed goal from inside the six-yard box. Barnsley 2-1 Middlesbrough. 57:07 Foul by Rhys Williams on Daniel Bogdanovic, free kick awarded. Free kick crossed left-footed by Emil Hallfredsson, clearance made by Tony McMahon. 55:38 Free kick awarded for a foul by Adam Johnson on Hugo Colace. Bobby Hassell restarts play with the free kick. 54:39 The ball is swung over by Jonathan Franks, Bobby Hassell manages to make a clearance. 53:53 Julio Arca has a shot on goal from long range that goes wide left. 53:28 Rhys Williams sends in a cross, Stephen Foster manages to make a clearance. 52:31 Shot on goal by Gary O'Neil from just inside the area clears the crossbar. 51:41 Marcus Bent fouled by Darren Moore, the ref awards a free kick. Gary O'Neil takes the direct free kick. 51:13 Shot from 25 yards from Anderson De Silva. Justin Hoyte gets a block in. 48:31 Assist by Emil Hallfredsson. 48:31 GOAL - Stephen Foster:Barnsley 1 - 1 Middlesbrough Stephen Foster finds the net with a headed goal from close in. Barnsley 1-1 Middlesbrough. 47:19 The assistant referee signals for offside against Daniel Bogdanovic. Indirect free kick taken by Danny Coyne. 45:30 Adam Johnson gives away a free kick for an unfair challenge on Anderson De Silva. The ball is sent over by Emil Hallfredsson, Stephen Foster takes a shot. David Wheater manages to make a clearance. 45:01 Substitution Jacob Butterfield replaces Adam Hammill. 45:00+1:45 The players leave the pitch at half time. 45:00+1:19 Free kick awarded for an unfair challenge on Gary O'Neil by Anderson De Silva. Danny Coyne takes the free kick. 45:00+0:48 The assistant referee signals for offside against Jonathan Franks. Indirect free kick taken by Hugo Colace. 43:58 Shot by Emil Hallfredsson from a long way out goes over the crossbar. 41:24 Anderson De Silva has an effort at goal from outside the box which goes wide left of the goal. 39:46 Unfair challenge on Andy Gray by David Wheater results in a free kick. Free kick taken by Hugo Colace. 38:13 Gary O'Neil fouled by Stephen Foster, the ref awards a free kick. Free kick crossed right-footed by Gary O'Neil, save by Luke Steele. 36:56 Unfair challenge on Daniel Bogdanovic by Tony McMahon results in a free kick. Adam Hammill crosses the ball in from the free kick. 35:41 Unfair challenge on Julio Arca by Anderson De Silva results in a free kick. Danny Coyne takes the free kick. 34:20 Booking Booking for Daniel Bogdanovic for unsporting behaviour. 33:14 Free kick taken by Rhys Williams. 33:14 Booking Bobby Hassell is booked. 33:05 Bobby Hassell concedes a free kick for a foul on Adam Johnson. 32:03 The free kick is swung in right-footed by Adam Hammill, Chris Riggott manages to make a clearance. 32:03 Booking The referee cautions David Wheater for unsporting behaviour. 31:23 Andy Gray fouled by David Wheater, the ref awards a free kick. 29:26 Booking Rhys Williams receives a yellow card for unsporting behaviour. 28:39 The ball is sent over by Adam Johnson, save by Luke Steele. 27:17 Shot by Hugo Colace from 20 yards. Blocked by David Wheater. 26:39 Gary O'Neil gives away a free kick for an unfair challenge on Stephen Foster. Bobby Hassell takes the free kick. 24:53 Effort on goal by Daniel Bogdanovic from just inside the box goes harmlessly over the target. 24:18 David Wheater gives away a free kick for an unfair challenge on Andy Gray. Free kick crossed right-footed by Adam Hammill from right channel, clearance made by Chris Riggott. 22:54 GOAL - Justin Hoyte:Barnsley 0 - 1 Middlesbrough Justin Hoyte scores. 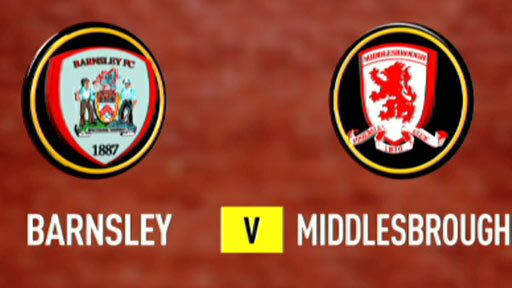 Barnsley 0-1 Middlesbrough. 21:21 The assistant referee signals for offside against Adam Hammill. Free kick taken by Danny Coyne. 20:23 Effort from just outside the box by Justin Hoyte goes over the bar. 17:15 Long range shot by Emil Hallfredsson goes wide right of the net. 16:17 Unfair challenge on Adam Johnson by Bobby Hassell results in a free kick. Free kick taken by Justin Hoyte. 15:39 Andy Gray concedes a free kick for a foul on David Wheater. Rhys Williams takes the direct free kick. 14:05 Foul by Julio Arca on Anderson De Silva, free kick awarded. Shot on goal comes in from Emil Hallfredsson from the free kick, save made by Danny Coyne. 12:33 Gary O'Neil gives away a free kick for an unfair challenge on Darren Moore. Direct free kick taken by Stephen Foster. 11:33 Marcus Bent is flagged offside by the assistant referee. Luke Steele takes the free kick. 8:49 Daniel Bogdanovic delivers the ball, save by Danny Coyne. 7:28 Effort from outside the penalty box by Adam Johnson goes wide right of the goal. 7:06 Corner taken by Gary O'Neil from the left by-line played to the near post, Darren Moore manages to make a clearance. 6:38 Shot by Julio Arca. Save by Luke Steele. 5:41 Anderson De Silva gives away a free kick for an unfair challenge on Julio Arca. Gary O'Neil takes the free kick. 5:09 Free kick awarded for an unfair challenge on Adam Hammill by Marcus Bent. Free kick taken by Robert Kozluk. 3:41 The ball is delivered by Adam Johnson, clearance by Emil Hallfredsson. 0:59 A cross is delivered by Adam Hammill.